Looking up the slope and over the shed. It is fitting that my first tower post after Sandy is about its foundation. The house is perched 20? feet above the Hudson River. I’ve always worried about the slope giving way. Now I can also worry about the Hudson rising and sweeping the house down to the city. Others say in ice. . . Please, please, please: may all those who admonish me for worrying about “worst-possibles” be the smart ones, and let me be the dummy. Dave started to dig, but I didn’t watch. Probably petrified. Up until now the project could be put in a box and stored in the lower yard shed. I had done that before – designed a new home and then put it in a box that now actually does sit in the lower yard shed. It was a very happy time for me, one of those times when I was glowing. Clark and I were starting a new chapter in our lives. Building a new home was not even a fleeting thought until our neighbor told us he was selling his lot across the stream behind our house. We lived in a small town with two dairy farms, on a quiet street near a pond with a stream that separated us from a beautiful large lot that belonged to the Davises. We loved where we lived. Every now and then the bridge over the stream would cave in and we were at the end of a dead end – that was best. The boys in the neighborhood (and there were many) used to climb down to the stream and do good old fashioned outside play. The lot intrigued us. We were thinking of closing Book Nooks & Krannies. Morgan and Alex were growing out of children’s books, Clark had actually gone back to high tech so that we could have health care, and without the family all involved, the store was not as much fun for me. I would be able to devote my time and energy to the house. The lot begged for a barn. We agreed on a price for the lot, and went up to spend a night at the Yankee Barn show home in Grantham, New Hampshire. The boys were still sleeping and Clark and I were downstairs in the kitchen having our coffee and talking about how much we liked the casual, comfortable look and feel of the barn home. All of a sudden a moose walked by. It’s amazing what influences my decisions. 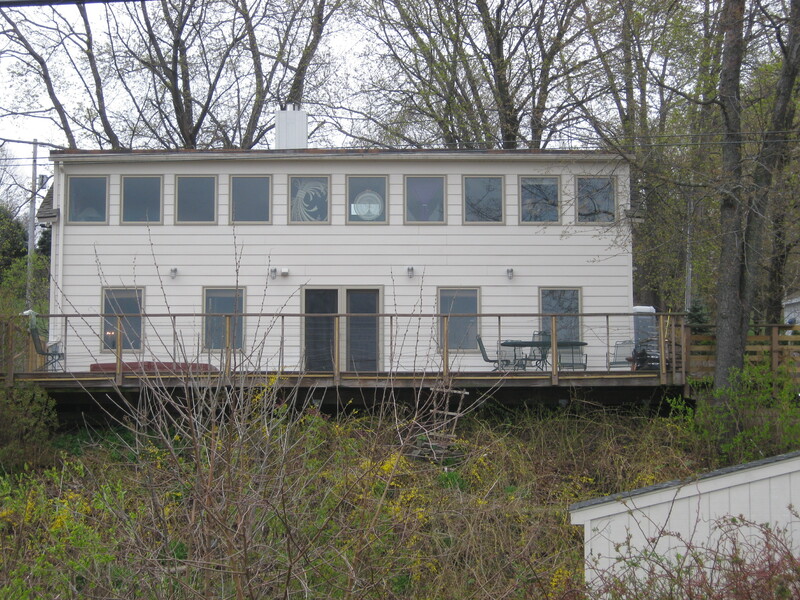 We spent several months designing our home, studying the sun and views and the slopes and the wetlands. The timing was unbelievable. We had already closed the store and were going to pass papers on the land in a day or two, right after the perc test. But during all this, unbeknownst to me, Clark was dealing with another issue. His father had just died, and he must have been thinking about his own mortality, because the week before the perc test he went to the doctor to have a swelling checked out. He had non-Hodgkins lymphoma. We decided not to do the house. It was a very sad time for me and a terrifying one for Clark. We had already closed the store, and I actually had taken a new job – librarian at Lowell National Historical Park. In fact, I started the job the day he received his diagnosis. I cried a lot in private and in public. It was Rosh Hashanah and the boys and I always met our neighbors at the temple. Tears ran down my checks the entire service. The front yard of my home slopes down from the street. 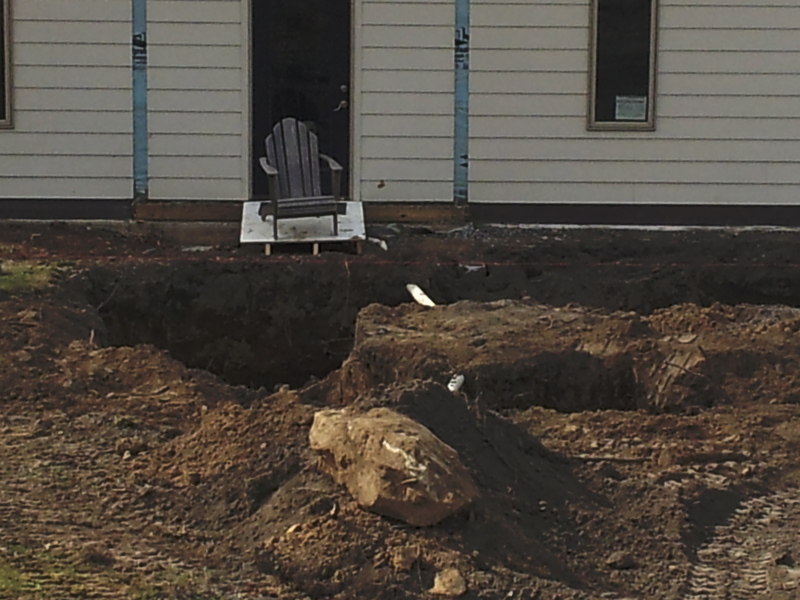 Dave thought if we went with the foundation as originally planned we would need to put in a retaining wall. He asked if we wanted to raise the foundation slightly. It would require a step at the door, but that rise would be offset elsewhere. I can’t remember the details, but it seemed logical. Nick came and built the forms and poured the foundation and then Sean laid sleeves between the cottage and the tower for the plumbing and heating, and Dave did the same for the electricity. When connecting the waste water pipes from the tower to those of the house we hit a snag. Besides my obsession about the slope giving way, I also have a thing about septic systems. This constant worry grew from having to build a new leach field when Clark and I were selling the house mentioned above because ours failed Title 5 in Massachusetts. Considering all the hassle and money Clark and I spent to replace that leach field I never felt comfortable with the fact that no one could provide me with a plan of the septic system when I was buying my current house. The county health department needed the date the work was done. My realtor looked at me funny when I asked who did septic inspections. All I learned was that the septic tank was under the stone that pointed north in the walkway leading to the house. If one worries long enough about something happening, it will happen. Sean was connecting the waste water pipes from the tower to those that led to the septic tank and found a mess. We had pumped the tank about a month before we started construction, so when we now found it full we knew there was a problem. The 3-inch pipe that led out from the tank ran uphill. Sean put in a bigger pipe, adjusted the pitch, and now I know all I want to know about the septic system. A load of stone for the foundation arrived on May sixteenth. 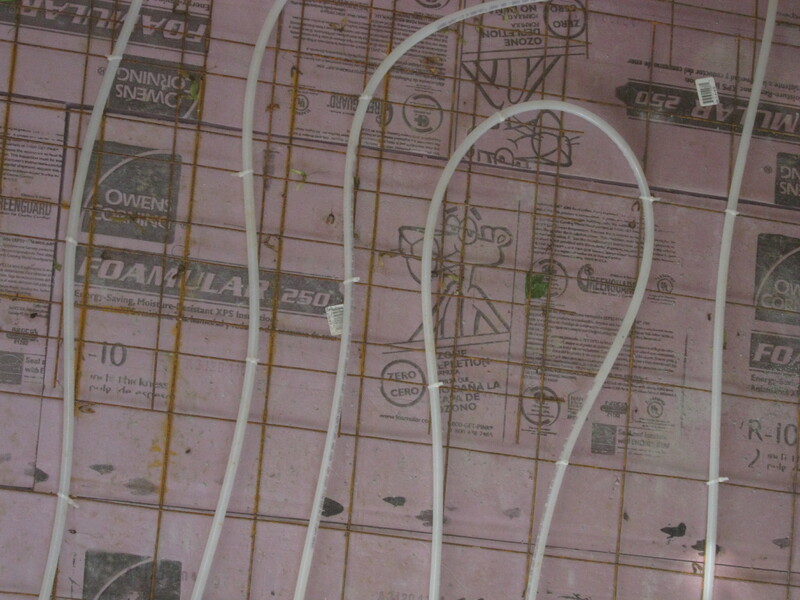 Lee and Derrick spread that and laid insulation, and then Sean came in to lay the tubing for the radiant heat. We weren’t home when Sean was doing this work, but he told us later that our neighbor came down on his tractor to tell him that he was uncoiling the tubing on his land. About a week later this neighbor installed a green plastic fence at the property line. Then we had to decide if we wanted a polished concrete or painted concrete floor on the first floor, or did we not want a concrete floor at all. Research on the subject proved inconsistent, but it seemed like a cumbersome, expensive process, with lots of possibilities for disaster. We unfortunately had lots of time to decide. For the next month or more, rain was forecast at least every other day. 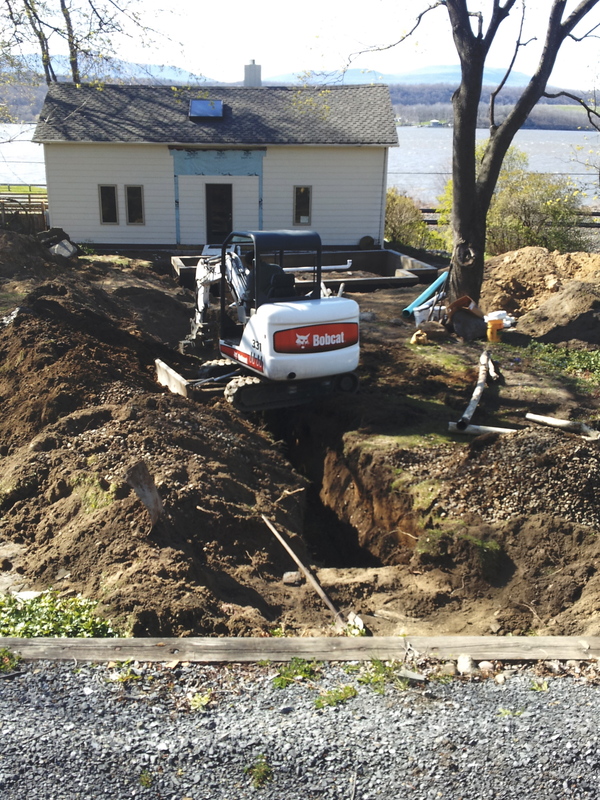 Nick, our excavator, was wary of having the cement mixer sink into a muddy front yard, so he held off until sunny skies were the norm. We chose to forgo the smooth, slick look of concrete. It wasn’t until we actually were going to buy flooring that we learned that outside of carpet or laminate there were very few “affordable” options. We did, however, find a very good looking and well made laminate, and are happy. 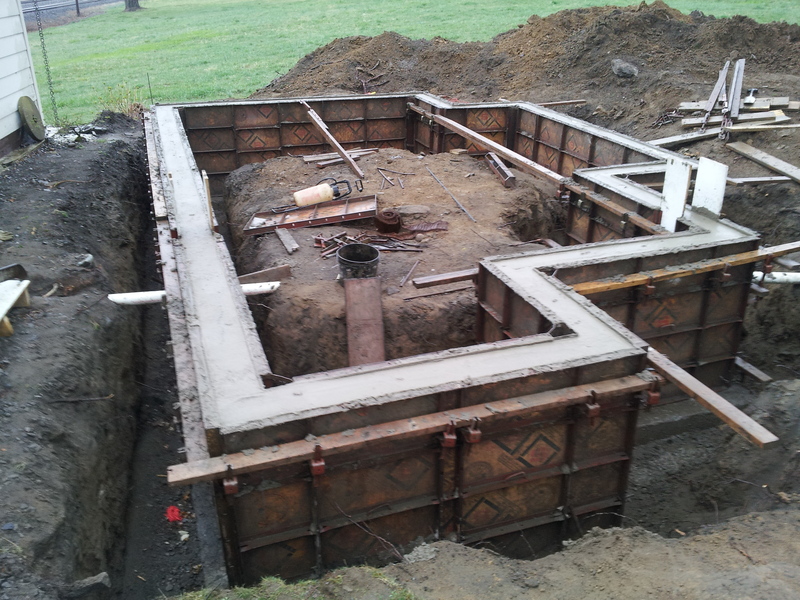 By early June the slab was poured and we could move about on the first floor. In the meantime Dave had been building the tower and pondering the bridge. This entry was posted in My Tower and tagged additions, Architecture, Clark, construction, excavation, foundations, heating, home, Lee, Life, plumbing, Sandy, septic systems, The Hudson River by spoonbeams. Bookmark the permalink.